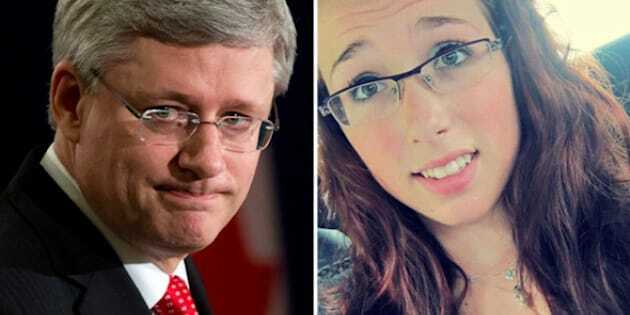 Two weeks after their daughter died following months of alleged online harassment, the family of Rehtaeh Parsons sat down with Prime Minister Stephen Harper and urged him to ban the distribution of intimate images online under the Criminal Code of Canada. The prime minister invited them to Ottawa to discuss cyberbullying. The family was accompanied by Nova Scotia Premier Darrell Dexter, who met separately with Harper. According to the Leah Parsons, four boys sexually assaulted her daughter when she was 15. Rehtaeh was then said to have been mocked by classmates, enduring relentless harassment and humiliation after a photo of the attack was circulated at her Cole Harbour, N.S., school and on social media. On April 7, Rehtaeh was taken off life support after attempting to take her own life a few days earlier. She was 17. Appearing on camera for the first time since Rehtaeh's death, her father Glen Canning said Ottawa must do "something" about cyberbullying. He said the 45-minute discussion was a "heartfelt" meeting between parents. “It’s frustrating for us to go through something like this and feel so defenceless to do anything at all to help our daughter. So we conveyed that message, we conveyed it very clearly. It’s sad it had to happen like this but it was just good to see there is something the government can do," he said. "For the way the laws are set up in Canada right now there was absolutely nothing we could do to help our daughter but stand there and watch her die." Federal Justice Minister Rob Nicholson also sat in on the meeting and said when he meets with Nova Scotia Justice Minister Ross Landry on Wednesday he will try to expedite the process. The federal government is promising to enact a Victim's Bill of Rights. "Our hearts go out to the family as they cope with the loss of their teenage daughter," Nicholson said. "Last October, following another unfortunate suicide, federal, provincial and territorial ministers of justice and public safety directed senior officials to identify potential gaps in the Criminal Code with regard to cyberbullying and the non-consensual distribution of intimate images." "When I meet with my justice counterparts tomorrow, I will recommend that we expedite the review of our laws, move forward and act to ensure that our children are safe from online exploitation." Dexter said his meeting with Harper was "positive," but wouldn't delve into specifics. "I have to leave it to the prime minister to talk about his own legislation. Obviously it's not something that would be appropriate for me to comment on, but what I can say is in our conversation he very much understood the concerns that I had about the particular aspects of the gaps that exist in the current Criminal Code," Dexter said. "He indicated to me he understood this issue and that they intended to move forward with legislation that would address the kinds of concerns that we had," said the premier. "The fact of the matter is, the activities that gave rise to this particular tragedy are criminal activities and they need to be seen that way. People who transmit intimate images without consent do so maliciously. They do so with the intent to injure." He said he'll leave it up to the justice ministers to establish punishments. "The things that are being done in the name in some kind of twisted logic of freedom on the internet, you know , we don't need to accept that. We shouldn't accept that, that somehow this kind of freedom allows you to destroy somebody else's life. We have to be able to find a way to harness it, to create like I say social disapproval." The public outcry over the case prompted the Nova Scotia government to announce a plan for an independent review into both the police investigation and the Crown attorney’s office that advised police not to lay charges in Rehtaeh’s case.